Millard Creek suffered yet another insult this weekend. 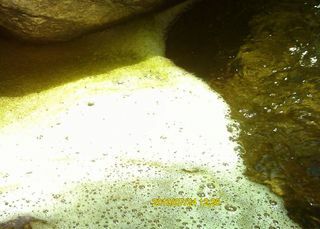 After being shut off for almost three days last week -- endangering the frogs, newts, and other riparian life -- a large amount of pungent, soapy foam was reported in the creek on Saturday and Sunday. Emails from wildlife biologist Lori Paul, who has been following the creek story all week, said that she was informed of "a very large quanitity of thick suds and foamy bubbles" that filled the creek starting Saturday morning. The foam reportedly smelled like "body odor" or "dirty socks," and tapered off in the afternoon. The sighting was also confirmed by Lonnie Fehr, the campground host. 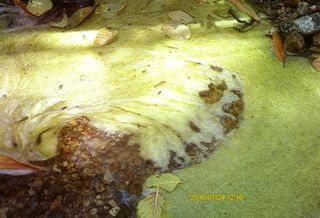 However, on Sunday, Paul reported big clumps of suds were again floating in the creek. Her calls to Lincoln Ave. Water, which diverted the creek early last week, found them denying it was part of their work, but water company employees did report red and discolored water from their dam above the Millard Creek waterfall, which they blame on chemical fire retardant used to fight the Station Fire. The source of the foam is being investigated. Photos: Lori Paul shares photos she received that claim to document Satuday's foam release.